Things feel like they’re about to get REALLY weird up in here. Not that I feel like things aren’t already weird. Don’t get me wrong, I acknowledge that I have a strange sense of humor and that my nerdiness is kinda odd. But, by weird I mean: I’m about to go zombie-crazy. I decided I want to do a whole bunch of zombie yumminess for the upcoming Halloween festivities. 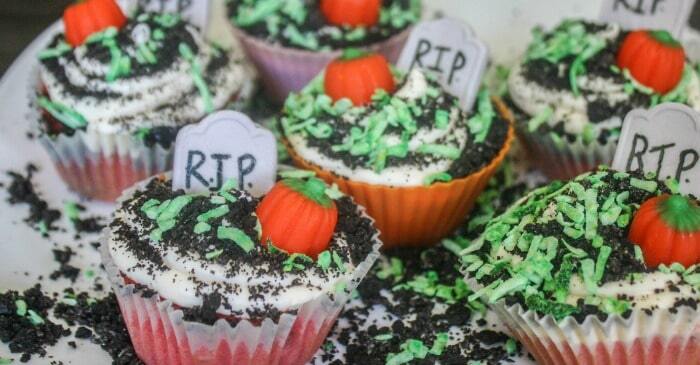 And, one of the first things I did: Graveyard Cupcakes. Ok, well, they’re bubble gum cupcakes just decorated to be graveyards, but that’s still…right? It’s still…LOL! 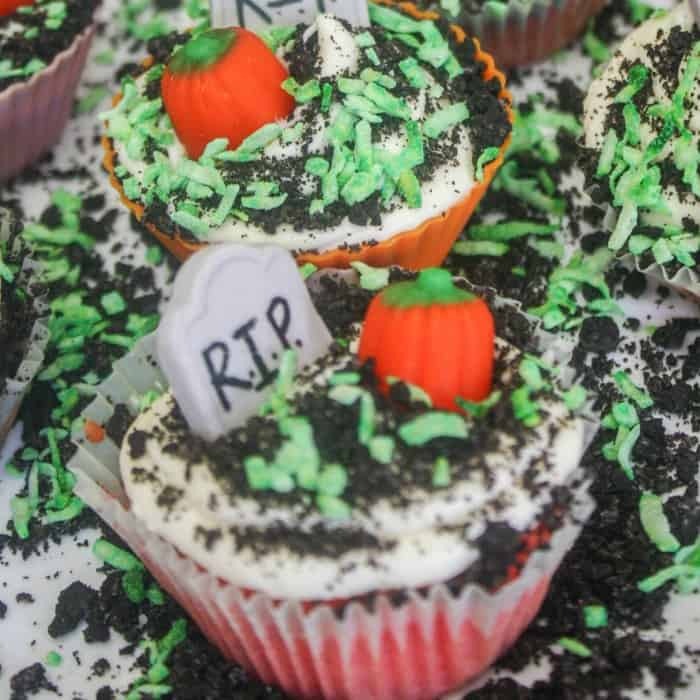 Ok, so maybe these Graveyard Cupcakes weren’t the FIRST thing I’ve done zombie-licious, not even in the recent past. Because, you know, I did a whole roundup of awesome zombie recipes, brain cookies, and zombie jello snacks. But, that’s ok, right. 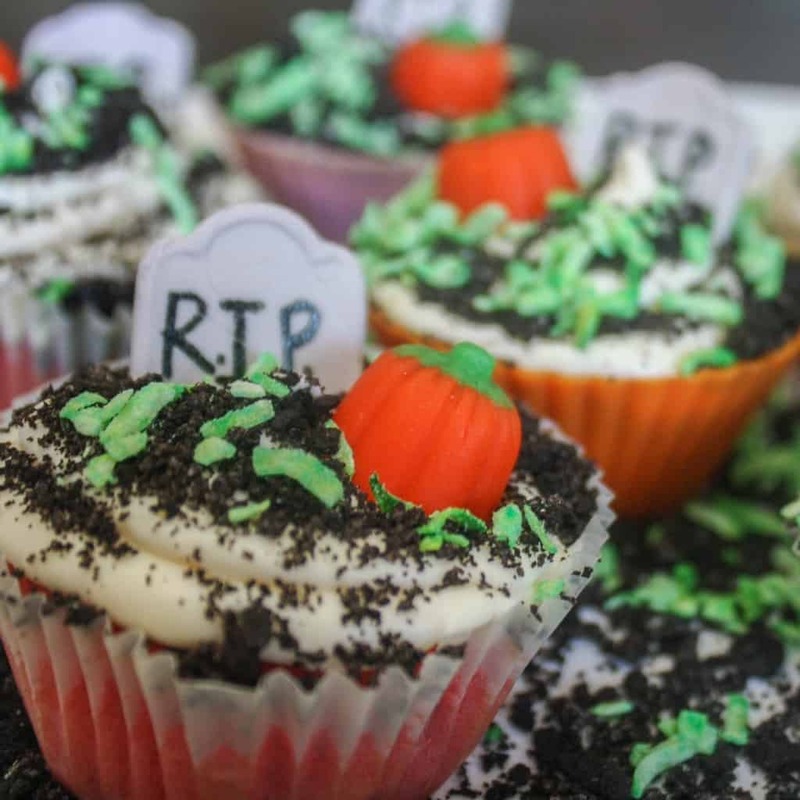 Because Graveyard Cupcakes were the first thing I did AFTER I decided to be all sorts of focused on zombiness….right?! LOL! 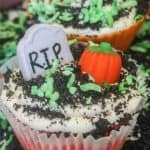 Regardless, this recipe for Graveyard Cupcakes is so much more than JUST little tiny graves of awesome cupcakery. They’re actually bubble gum cupcakes. Yeah–you heard that right. And, as I jam another into my mouth so ungracefully that my mom would give me the evil-eye, I would like to point out that they’re yummy. A big-ole-cupcake-of-yummy. That’s what these tiny graveyards can offer. Cool, huh? Ok. So, go grab this stuff–and maybe a few other things, I don’t know–it’s late and I’m incredibly tired. Just pin this so that you can make it whenever, because we both know you’re not in the kitchen about to make a batch of Graveyard Cupcakes. Seriously. LOL! 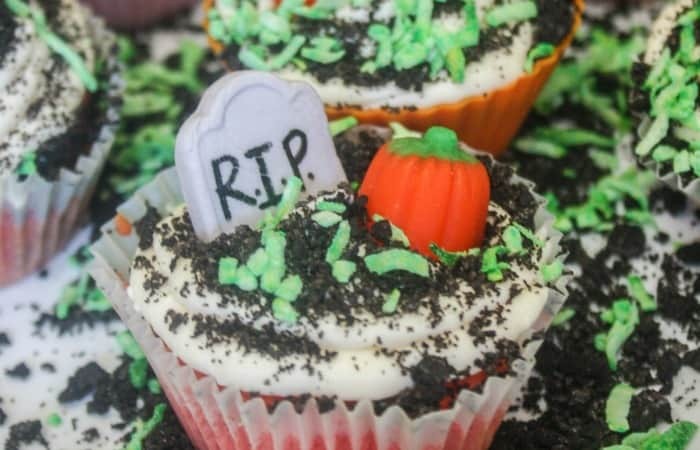 one of the first things I did for Halloween prep this year: Graveyard Cupcakes. Ok, well, they're bubble gum cupcakes just decorated to be graveyards, but that's still...right? It's still...LOL! Place paper baking cups in 12 muffin tins. Cream the Butter or Margarine and gradually add Sugar. Add aquafaba and beat well. Set aside. Combine dry ingredients and stir. Add ⅓ of dry ingredient mixture to butter and sugar mixture, mix. Combine Coconut Milk, Vinegar, Food Coloring and Flavoring, and add ⅓ of milk and flavoring mixture to other mixture, mix well. Alternately add ⅓ of dry ingredients and ⅓ of milk and flavoring, mixing well between additions. Fill cupcake cups about ½ to ⅔ full. Bake for approximately 12 - 14 minutes. While that's baking, in a large mixing bowl, beat Coconut Cream on high until it begins to thicken. Continue beating on high until the mixture becomes stiff and holds its shape. Place icing in the refrigerator until you're ready for it. Remove cupcakes from the oven and allow to cool for about 10 minutes. Crush the cookies in a baggie. Sprinkle a portion of the crushed cookies onto the top of each cupcake. Mix green food coloring and coconut in baggie together until coconut is green. Sprinkle green coconut "grass" on top of the crushed cookies. Place headstone and pumpkin on top of the cupcake. Put the cupcakes in the refrigerator for as long as necessary until you're ready to unearth the awesomeness and eat them.